I know almond milk is all the rage these days with clean eating enthusiasts, but the truth is if it is a highly strained almond milk that also has tablespoonfuls of sugar added to it, then it’s not really offering much in the way of nutrition. I don’t want to bash name brands, but if you have been disappointed by the wateriness of the various almond milk brands you have tried, then that’s surely because they are not “whole” almond milk. It’s kind of like the difference between drinking whole milk and skim milk. Considering that cow’s milk does not do a body good, if push came to shove I would have to choose store-bought watery almond milk over skim milk but that’s not because of the health benefits of almond milk. I would only choose highly strained store-bought almond milk over skim milk because at least the almond milk does not come packaged with all of the negatives associated with cow’s milk. But the point is, watery almond milk is not a nutrient-dense beverage. The problem with commercially produced almond milk is that the vast majority of brands contain less than 5 per cent almonds, the rest of the “milk” consists of water with some emulsifiers and added synthetic nutrients. Calcium Carbonate, Vitamin E Acetate, Zinc Gluconate, Vitamin A Palmitate, Riboflavin (B2), Vitamin B12, Vitamin D2. This particular almond milk brand advertises that their product contains 50% more calcium than cow’s milk and that it is an excellent source of vitamin E. However, this type of marketing is deceiving to the consumer considering that this brand of almond milk does not naturally contain significant amounts of calcium or vitamin E; instead the almond milk has been artificially fortified with these synthetic nutrients. What companies are doing to almond milk today is basically the same thing they did to flour years ago. Basically, they are processing a food and removing all of the good nutrition and then “fortifying” the food with synthetic nutrients. The health benefits of commercial almond milk are practically non-existent for the same reason that enriched white flour is also not healthy. If you have our Clean Cuisine book then you know we are against fortifying foods with synthetic nutrients. Your body will never be able to utilize a synthetic nutrient the same way it can utilize nutrients from whole foods. As down as I am on most commercial almond milk, homemade almond milk done right is a completely different story. If you Google “How to Make Homemade Almond Milk” you’ll see a number of different recipes pop up. The problem is almost every single homemade almond milk recipe requires a lengthy process of soaking the almonds overnight (or for up to 2 days), then using a high speed blender to process the almonds with water and finally straining the almond meal with a cheesecloth. The straining is the part I have a problem with. Straining the almond meal removes all of the nutrients! 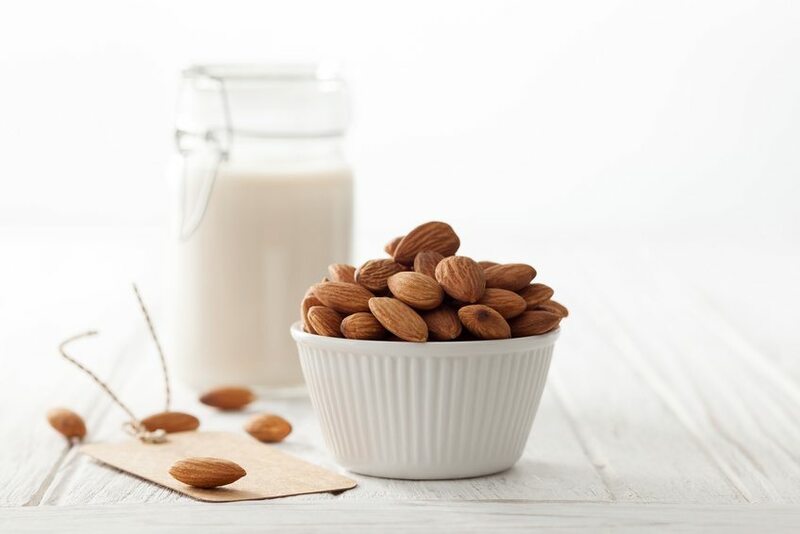 It is true that homemade strained almond milk does not have synthetic nutrients added and often contains less sugar than commercial versions, but that doesn’t make it a super nutritious milk alternative. It also doesn’t make it a rich and creamy alternative either. In other words, strained homemade almond milk is still going to have the consistency of skim milk. Not good. I have found the simplest, tastiest and most nutritious way to make homemade almond milk is to simply use raw almond butter. Of course you could always use whole almonds instead of almond butter, but you would definitely need to soak the almonds first. I have found using raw almond butter to be much easier and surprisingly tastier too. Raw almond butter is made with “whole” almonds, so it is a “whole” food. You get all of the incredible health benefits of almonds from “whole” almond milk made with raw almond butter. You get a significant source of REAL antioxidant vitamin E, REAL calcium, trace minerals, plant-protein and so much more. The far-reaching benefits of whole almond milk verse conventional almond milk can be compared with the benefits of “whole” juice. The only juice we drink in our house is “whole” juice made from the “whole” fruit; conventional juice is just a processed food with the anti-inflammatory fiber removed. Once you remove the fiber from the fruit the sugar that is left behind is rapidly absorbed and can elevate insulin levels, promote inflammation, promote fat storage, etc. When you remove the pulp from “whole” almonds to make almond milk you are, in essence, turning almonds into a refined food to drink. Not nutritious. There is simply no way around it, almond milk that is strained is just not as nutritious as “whole” almond milk. The most nutritious, delicious and best homemade almond milk recipe is also incredibly easy to make using raw almond butter rather than whole raw almonds. Combine all ingredients in a blender and process on high speed for 1 full minute. 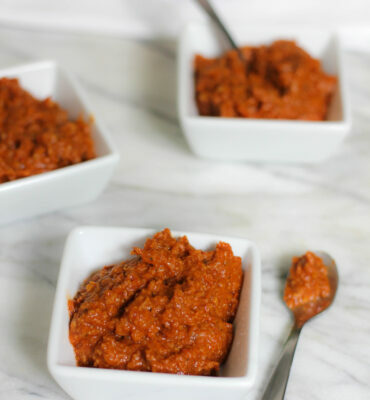 Transfer to a glass container and refrigerate until serving time. Shake well before serving. P.S. 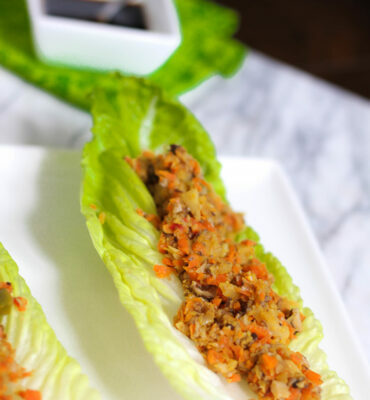 WANT TO LEARN MORE ABOUT HOW TO EAT CLEAN? 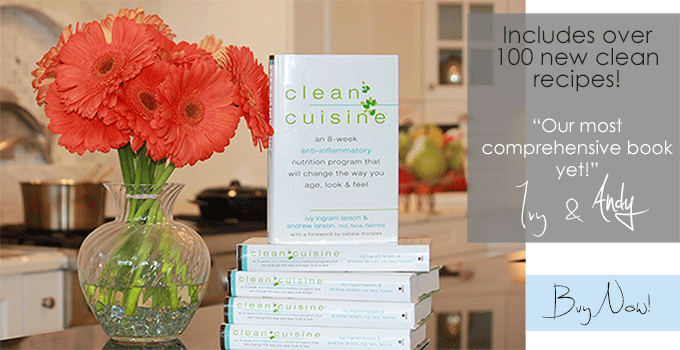 Did you know our Clean Cuisine book includes an 8-week anti-inflammatory lifestyle plan along with 100 all new recipes not featured on the blog? That makes complete sense. And I definitely would love to try that and have felt the same about our almond milk here. Even though I have unsweetened, one has vanilla and the other original I could probably play to make ours all individually fairly easily. My only question is this. If you drink 16 oz of almond milk/day. That’s 1/2 cup of almond butter which is about 60 grams of fat! For someone like me who needs to lose 15 pounds, while I may only drink 1 cup/daily that’s still 30 grams of fat right? ? Now my kiddos definitely have 16 oz. daily. Isn’t 60 grams of fat regardless of being natural or good fat isn’t that a lot for an 8 & 11 year old? Hi Christen, That is a GREAT question! Although we are not at all big advocates of counting calories, fat grams, etc. (here is why: https://cleancuisine.com/calorie-counting-is-not-helpful-all-calories-are-not-equal/ ) I absolutely understand your concern. But here’s the thing, you will naturally get VERY full if you tried to drink 16 ounces of full-fat almond milk a day. So full in fact that I actually do not think you would be able to do so UNLESS your body really needed the calories. Our son is 15 years old and still not 100 pounds—his body is going through a rapid growth phase though and the amount of food he is able to consume at this stage is rather startling. However, I do not even attempt to limit the calorie or worry about the fat grams he is consuming. As long as it is “whole food” and nutrient-dense I just feed him what his body needs. As for me, although I am not trying to lose weight, at 40 years old I also am not trying to gain weight 😉 I personally though do not drink almond milk or any other milk straight up—I always use it as part of a recipe, a smoothie, in my morning oatmeal, etc. So for example, if I am making a smoothie I might only be using 1/2 cup of almond milk along with other ingredients or if I am having oatmeal I might only be using 1/4 cup (I cook my oatmeal in water always but then like to add about 1/4 cup almond milk on top) So here is what I would suggest if you are trying to lose 15 pounds…I would not drink almond milk straight up but rather I would use it the way I do as an ingredient in other foods OR if you really want to just drink it straight up I would simply dilute it a bit with water. You can always make “skim” almond milk simply by adding an additional cup or 2 cups of water. You will still be getting all the nutrition of the original recipe—just not as much! Hi Diane! Oh no =( I am so sorry it didn’t save properly. I have never actually downloaded a Kindle version of anything so I wouldn’t even know how to walk you through it. I have the recipes all saved as word document files, which I can email to babeunit@hotmail.com –I’ll try to send them over to you right now. Please let me know if they don’t go through. FYI–I will be out of the country for the next 10 days so if for some reason I don’t email you back right away after tomorrow that’s why! Where can you buy almond butter? More like ⭐⭐⭐⭐⭐⭐⭐⭐⭐⭐ sooo much better than any store bought I’ve had, and no straining needed. I ground the almonds in Whole foods, so it was fairly inexpensive!